Provides support and alleviates wrist pain caused by injury, carpal tunnel, tendonitis, or arthritis. It is made with breathable neoprene, and features a removable splint and extra-strength fastening material for customizable support. 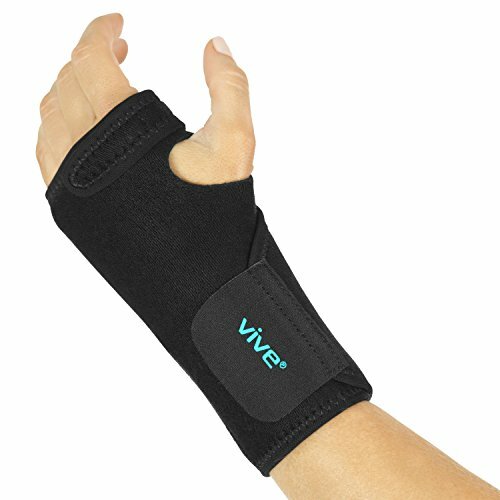 PROTECT AND STABILIZE YOUR WRIST: Stabilizing and supporting the wrist, the lightweight wrist brace by Vive provides maximum support to reduce pain and inflammation and prevent re-injury. Fully adjustable, the compression brace retains therapeutic heat to improve circulation and promote healing. The lightweight brace, with a removable splint, allows the full use of your hand, so you can easily complete everyday activities. REMOVABLE SPLINT FOR FLEXIBLE USE: A lightweight, durable splint stabilizes the wrist in a neutral position for optimal relief. The splint is also removable, allowing you more flexibility while providing adequate wrist support. CUSTOMIZABLE COMPRESSION THERAPY: Two adjustable straps allow you to customize the amount of compression to effectively reduce pain, inflammation and swelling. Great support brace for arthritis, carpal tunnel, tendonitis, repetitive stress injury, post-surgery, sprains and strains. ADJUSTABLE LIGHTWEIGHT DESIGN: Universally sized to accommodate most hand sizes, the wrist support brace features two adjustable straps with extra strength fasteners for a personalized fit without slipping or bunching. The breathable neoprene keeps your hand and wrist cool and comfortable throughout the day.